Empire carpeting: workers were great. Carpeting is very inferior, shows seams where there aren't any. Threads pulled, looks crummy period. Not a very big selection for the price. It actually looks dirty. The salesman asked me what I thought was a fair price and I sure overpriced it. Should have checked further before committing to Empire. I wouldn't recommend them to my worst enemy. I think they should be put of business before other people get taken for a ride. 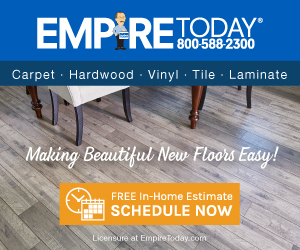 I am going to try to get new carpeting from a reputable dealer and will check on line first. What more can I say? Review #141193 is a subjective opinion of User141193. Anyone who has any pets should know better then to buy berber. I own three know, five within the last year and berber loops get pulled by the nails from the dogs. Shame on you for blaming it on the carpet when your dogs more than likely caused the pulls. HA! No crappy, cheap carpet and poor workmanship are the problem. They sent out an "independent" carpet inspector but when I called about the inspection, they had to logon to a different site so those "independent" inspectors are in their back pocket. Said they would come out to fix a couple areas but for the most part, I am screwed. Carpet is only 16 months old and looks like ***!